Following a wildly successful DesignerCon, Mr Scott Tolleson has kindly reserved a limited number of his DCon Shard Dunny that were released this past weekend. They are now available to one & all! These are absolutely sublime! We’ve seen them in person (FINALLY) and we can now fully understand why folks go nuts over these Shard! Now available on the Tolleson website, you can grab your 3inch Pain Shard for $60 (£47) + shipping HERE. The 5inch Panic Shard Dunny, with its aqua & white swirl, is available for $150 (£117) + shipping HERE. 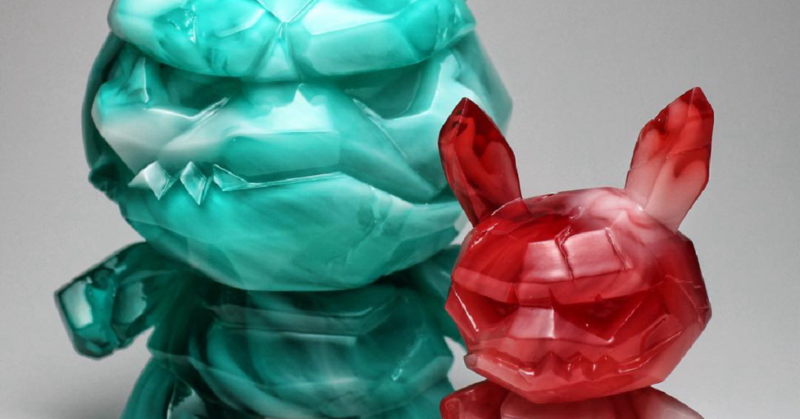 If anyone purchases both Shard Dunny they will receive a FREE GID SHARD PIN in their order! ***INTERNATIONAL CUSTOMERS – – IMPORTANT PLEASE READ: Please purchase as normal through the Tolleson website. You will receive a second invoice for an additional $20 to be paid before shipping to cover the cost of international shipping. Please note that there is a limit of THREE Shard Dunny per customer!